Late in the 1950s and into the early 1960s Ferrari developed a series of V6 engines for use in Formula 1 Formula 2 and sports racing cars. As a budding engineer Enzo?s young son Alfredo ?Dino? Ferrari played an essential role in the development of these engines and was a leading proponent of the V6 layout. These engines proved to be very successful for Scuderia Ferrari in many forms of motorsport including securing the 1961 Formula 1 World Championship with the Tipo 156 driven by Phil Hill. Sadly Dino suffered from a form of muscular dystrophy and passed away in 1956 never getting to see his efforts come to fruition. In a personal tribute to his son Enzo ensured and Ferrari V6 engines would carry the Dino name on the cam covers from then on. Later in the decade the V6 engine would play a pivotal role in one of Ferrari?s greatest ever road cars.With the compact and versatile V6 in the company portfolio talk of a junior-level Ferrari to take on the likes of Porsche and Jaguar resurfaced even as the commercial failure of the ASA 1000GT was still fresh in everyone?s mind. This time Ferrari was better prepared to produce a car that could compete head-to-head with vehicles like the new Porsche 911. The stars aligned in 1965 when changes to the Formula 2 rules called for a minimum of 500 engines be produced for homologation purposes. Ferrari in turn struck a deal with Fiat boss Gianni Agnelli to provide engines for a top-line V6-powered Fiat sports car. The arrangement allowed Ferrari some time to develop their own sports car to suit the latest Dino-branded engine.Several prototypes and styling exercises hinted at what was to come and production of the Dino 206 GT began in 1968. Aldo Brovarone and Leonardo Fiavoranti penned the stunning body at Pininfarina and Scaglietti built the bodies out of aluminum. Motorsport influenced the design of the tubular chassis and transverse V6 mounted amidships making it the first volume production mid-engine Ferrari road car. While the Dino was developed in-house at Maranello the car was marketed under the separate Dino banner devoid of all exterior Ferrari badging. After 154 vehicles the 2.4-liter steel-bodied 246 GT replaced the 206 GT. The buying public and motoring press alike fell head over heels for the Dino with near-universal praise for its gorgeous design as much for its razor-sharp kart-like handling and sonorous engine. The Dino?s place in Ferrari lore is significant as it signaled the start of a shift toward industrialized volume production methods. In recent years Dino values skyrocketed as collectors have come to appreciate this sublime little car as one of the greatest driving Ferraris ever built despite never officially carrying the Prancing Horse badge.It is with distinct pleasure that we offer this stunning 246 GT serial number 05036 fresh from a world class restoration by Fran Roxas and presented in its original colors of Rosso Chiaro over a black interior. S/N 05036 is a desirable E-series European specification Dino completed in September 1972 and delivered new to Germany. The Dino Registry indicates it left Germany in approximately 1976 headed to California for then-owner John DiGiorgio. In 1978 Mr. DiGiorgio sold S/N 05036 to Frank Anthony Vizcarra of Richmond California who cherished his Dino for the next 34 years. By 2012 05036 was in need of a freshening and Mr. Vizcarra sold it to a dealer in Florida who in turn sold it to the most recent owner. Upon taking delivery the new owner initially planned to reinstall the engine (which had been removed by Mr. Vizcarra for repairs) and simply enjoy the car as-is following some mechanical sorting. However the project quickly evolved and soon 05036 was stripped to bare metal shell in preparation for a methodical nut and bolt concours-quality restoration.Photos of the restoration process reveal the car has an exceptionally straight and rust free body and structure. The exquisite paintwork in factory-correct Rosso Chiaro is exemplary of the sort of work Mr. Roxas built his reputation on. The color is applied to laser-straight panels with crisp lines and precise consistent gaps all around. Chrome and brightwork exhibit the same exceptional quality and precise fitment. The car wears all new body rubbers and the car retains the correct European side markers and new Carello headlamps. Proper 14-inch Cromodora alloy wheels fitted with Michelin XWX radials achieve the factory-correct stance on the road.Inside we find the same attention to detail with beautifully restored seats in correct fine-grain black leather updated with contrasting red Daytona-style inserts. The dash was stripped and restored in original-style low-glare ?mouse fur? material while the door panels rear panel and sills are trimmed in original-type heavy-grain leatherette. The original Dino-branded Veglia instruments and original controls are fully restored and a period Becker Grand Prix is fitted. In addition a set of custom-fitted Cocomats is included to protect the fresh black carpet. As with the exterior the interior of this Dino is gorgeous exquisitely finished and absolutely fresh.Beneath the engine cover sits the original 2.4-liter V6 engine and 5-speed transaxle both comprehensively rebuilt and assembled using proper hardware plumbing and fittings. It runs and drives beautifully as one would expect from such a recent and complete restoration. Braking and cooling systems are fully overhauled using genuine factory components and the exhaust is a new correct Ansa system. The chassis and undercarriage are virtually spotless featuring restored dampers in proper Koni orange painted suspension arms and fresh cadmium plated fasteners. Every component received the same attention to detail and the finish work is outstanding from the suspension to the belly pans to the last piece nut and bolt.In addition to the history of 05036 as provided by the Dino Registry a complete Massini Report is included verifying this car?s original engine gearbox colors and specification. Included in the sale are the original books and manuals in the leather wallet original tool kit and roll and original jack and pouch obtained directly from Mr. Vizcarra.With its flowing lines and delicate proportions many enthusiasts consider the fixed-roof GT to be the purest expression of the original Dino design; and this car?s impeccable presentation highlights that undeniable beauty. One of the finest examples we have encountered S/N 05036 is ready to debut on the concours circuit. However it is on the road where the Dino is best appreciated as the sublime chassis and V6 engine blend seamlessly to into one of the greatest driver?s cars to ever pass through the hallowed gates of Maranello. 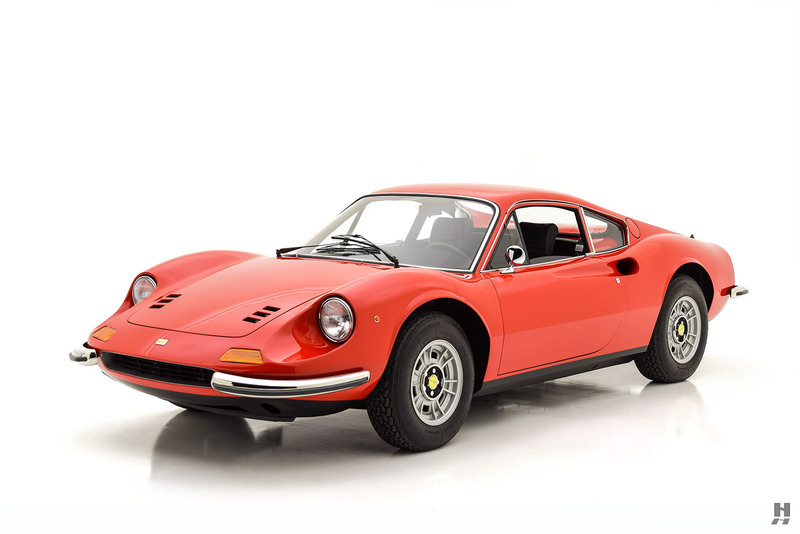 I am interested in this 1972 Ferrari Dino 246 GT that recently sold on duPont Registry.